“The NoMa Parks Foundation turned on the power today for Rain, a dynamic light installation in the M Street NE railway underpass. 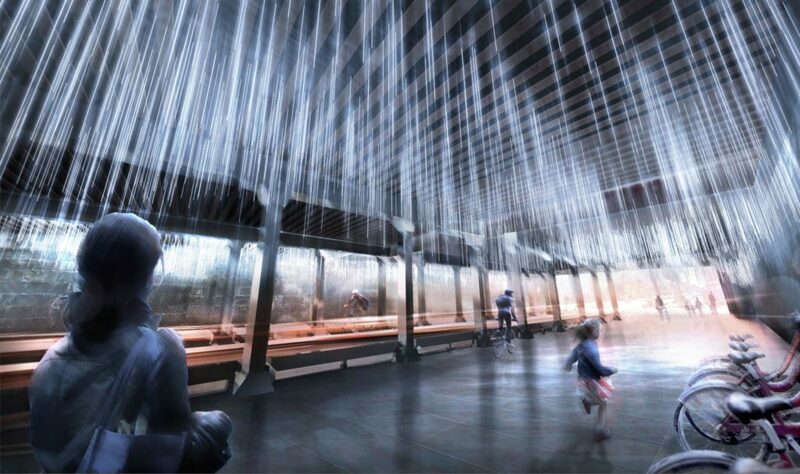 Comprising 4,000 LED-powered polycarbonate rods suspended above the underpass sidewalks, the artwork will illuminate the space 24 hours a day and pulse like gentle waves of rainfall in response to the flow of vehicular traffic beneath the elevated tracks. Rain is the first of the NoMa Parks Foundation’s four planned underpass “art parks” to open and was designed by Thurlow Small Architecture of Oakland, California, working in conjunction with Dutch firm NIO architecten in response to an international competition held by the Foundation. In early 2014, the NoMa Parks Foundation announced the international design competition to transform the four railway underpasses in NoMa. The initiative, part of the NoMa Business Improvement District’s 2012 Public Realm Design Plan and strongly supported by the community, will turn the underpasses at Florida Avenue and K, L, and M streets NE into stunning contemporary art installations. Although the winning designs for M and L streets were announced in the spring of 2015, delays in the permitting and permissions process meant they could not begin construction until this year. The second art park installation — Lightweave, by San Francisco’s Future Cities Lab, an art and design studio — will begin construction in the L Street NE underpass in November 2018. Work is expected to take three to four months. In addition, the NoMa Parks Foundation also has two public park projects in progress: (1) Swampoodle Park, an 8,000-square-foot dog park and children’s play space at the corner of 3rd and L streets NE, which will open in November; and (2) “Tanner Park,” a 2.5-acre park along the Metropolitan Branch Trail above New York Avenue NE, which will begin construction by year’s end.